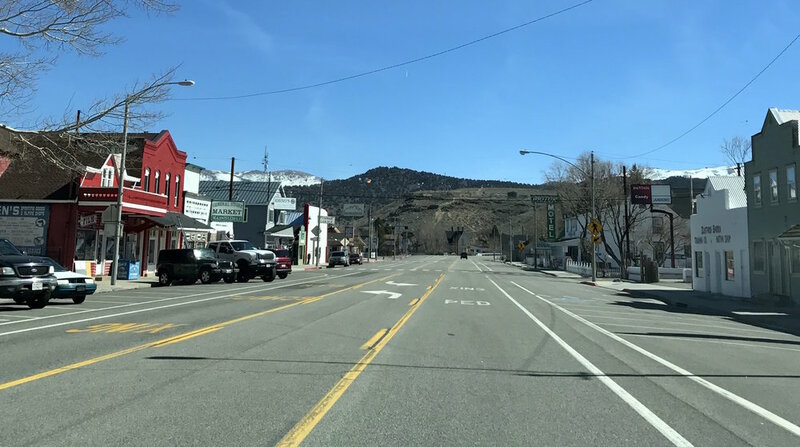 The charming and historic town of Bridgeport is located about an hour north of the much-larger Mammoth Lakes, but Bridgeport remains the Mono County seat. The crown jewel of the downtown is the historic Mono County Courthouse, built in 1880 and listed on the National Register of Historic Places. It’s locally known that there are only two seasons in Bridgeport, “fishin’ season and freezin’ season,” a distinction which dictated the hours of operation at the now-defunct Hays St. Cafe. Indeed, fishing is the lifeblood of the area—thousands of annual visitors pay homage to the trout-filled lakes and rivers accessible from Bridgeport. The Bridgeport Reservoir, the East and West Walker Rivers, and Twin and Virginia Lakes all count Bridgeport as the closest place to stock up on supplies, and the multitude of downtown shops that cater to anglers is a testament to that industry. There are a myriad of other reasons to visit Bridgeport as well—two incredible natural hot spring areas are located within a few miles of the town. Travertine Hot Springs is featured on the front cover of the Falcon Guide’s third edition of “Touring Hot Springs California and Nevada,” and is run by the Bureau of Land Management. Incredible formations of minerals have created an awe-inspiring and otherworldly landscape at Travertine, which features a multitude of pools to soak in. Camping is not allowed at Travertine, but there is BLM land surrounding the area which is available for dispersed (no water or toilets) camping. Buckeye Hot Springs is an incredible experience, boasting several hot pools fed by a steaming waterfall next to a mountain stream, but avoid it in the spring where cold runoff can invade the pools and turn them lukewarm at best. The Buckeye Campground is nearby but books up fast in peak season. There are limited options for hotels in Bridgeport, but the Ruby Inn is the most modern accommodation, with straightforward rooms located in downtown, as well as an outdoor pool and hot tub. The Bridgeport Inn, built in 1877, is a little more dated, but the ambience is enjoyable and their bartender serves up the best Bloody Marys in town in the atmosphere-rich bar. They are only open from March-November. The Virginia Creek Settlement, located about five miles south of town and adjacent to the road that leads to the incredible ghost town of Bodie (a State Park, and not to be missed for any lover of California History), is a fun place to stay, offering a campground, cabins, motel rooms and a “camp town” of tent cabins if you really want to feel part of the Wild West. The attached restaurant, adorned with old-timey memorabilia, serves excellent Italian food. Don’t miss the Spumoni ice cream. Visit Rhino’s in Bridgeport for a true dive bar experience, and you may even encounter some members of the Bodie Chapter of E Clampus Vitus, “a drinking society with an historical problem,” in their natural environment. You’ll know them by their trademark red shirts. Bridgeport is also famous for its Fourth of July celebrations, a three-day tradition which began in 1862 and is which is always good for a hoot and a holler. The festivities include a lakeside fireworks display, rodeo, live music, cowboy poetry, and arts and crafts booths which line Main Street (also Highway 395). The area is a mecca for game hunters in the fall, and the leaf-peeping in October will satisfy those who’d prefer not to get their hands dirty. The town is briefly mentioned in Jack Kerouac’s “Dharma Bums,” as the jumping-off point for Ray Smith, Japhy Ryder and Henry Morley’s climb to Matterhorn Peak—and it’s still the base camp for many backcountry adventures to this day. You can’t miss Bridgeport’s Jolly Kone, with its festive white-and-red checkered facade and big red sign, on the north side of Highway 395. The place is rich in history—Amasa Bryant, one of the founding families of Bridgeport, opened a store on Court Street at the same location the burger stand is now located in 1863.